The second game of the St. Louis series ended the same as Opening Day and the main reason was the pitching. Bronson Arroyo was comparable to Scott FeldmanÃ¢â‚¬â„¢s Opening Day performance. It wasnÃ¢â‚¬â„¢t good. I was a big Bronson fan the first time he was on the Reds and it was great to see him and his high leg kick back in action, but I remember him having a few good outings and then having a really bad one where he would only last a few innings and give up multiple home runs. Yesterday was one of those bad outings. 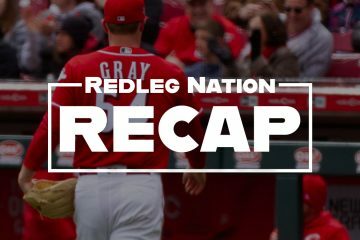 The start to the season has been pretty exciting from a Reds fan perspective and as good as anyone couldÃ¢â‚¬â„¢ve expected. 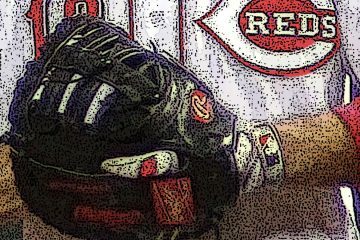 Before this game ended the Reds were 3-1 and atop the NL Central thanks to a great start by Brandon Finnegan, a great MLB debut by Amir Garrett, and some great bullpen work. This game seemed like the Reds threw in the towel before the game even started not only by starting a 40-year-old Bronson Arroyo, but by giving three everyday starters the day off. I donÃ¢â‚¬â„¢t know if it was a matchup thing or why they gave three starters the day off this early into the season, but it really hurt the chances of the Reds winning this game. Scooter Gennett was a great pick up and I think heÃ¢â‚¬â„¢s a great guy to have on the bench who can serviceably start once a week or so, but the other two should be starting as little as possible. ItÃ¢â‚¬â„¢s funny that two of the three players they replaced came in later in the game and both contributed going a combined 2-2 including the Reds only home run of the day. They had 2 of the Reds 7 hits in 2 at bats. The Cardinals easily won on Sunday 10-4, thanks in large part to Aledmys DÃƒÂ­azÃ¢â‚¬â„¢s 3-4 and two home run day. Michael Wacha pitched 6 innings of 1 earned run baseball.Ã‚Â Ã‚Â There werenÃ¢â‚¬â„¢t many bright spots for the Reds this game. Eugenio Suarez played really well both offensively and defensively. ThereÃ¢â‚¬â„¢s been a lot of talk on how much his defense has improved, and he really looked good today. He also went 2-4 and had 2 RBIs. Wandy Peralta also looked pitching 1 and a third of no hit baseball. There were a few hits here and there but thatÃ¢â‚¬â„¢s the only positives from a Reds standpoint. Robert Stephenson continued his command problems walking six batters in one and two thirds innings. Thanks to my fiancÃƒÂ© being a huge St. Louis Cardinals fan and being friends with a St. Louis Cardinals employee IÃ¢â‚¬â„¢ve been to St. Louis quite a few times the last couple of years. Ballpark Village really complements new Busch Stadium. It really improves the whole ballpark experience. I know Cincinnati has a few bars and restaurants that are close to the stadium, but this is almost an extension of the stadium. ThereÃ¢â‚¬â„¢s like four to five different restaurants/bars and theyÃ¢â‚¬â„¢re all connected. There is also a Cardinals team shop in there as well. ItÃ¢â‚¬â„¢s more comparable to Wrigleyville than the Great American Ballpark area. Because of this and the atmosphere there, we went there both before and after the game. 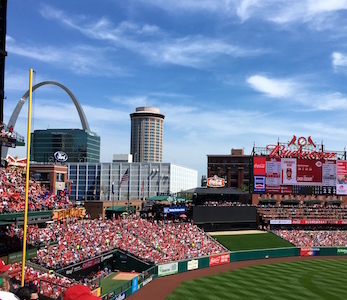 New Busch Stadium opened in 2006 and holds 43,975 people. It is set up really well and is the best stadium IÃ¢â‚¬â„¢ve been to that isnÃ¢â‚¬â„¢t Wrigley or Fenway. Other stadiums that I have been to include: Great American Ballpark, Jacobs Field, Coors Field, New Comiskey, Tropicana Field, Turner Field, and Target Field. The backdrop is also really pretty with the Arch and a few other buildings. It is also always crowded at every game IÃ¢â‚¬â„¢ve been to, but IÃ¢â‚¬â„¢ve also always gone on the weekends. The atmosphere has been better than most of the Reds games IÃ¢â‚¬â„¢ve gone to. The negatives of the ballpark would mainly be food and food options in my opinion and especially compared to Great American Ballpark. GABP has a great selection of food and everything is very good. BuschÃ¢â‚¬â„¢s beer selection also isnÃ¢â‚¬â„¢t as diverse as GABP, but youÃ¢â‚¬â„¢re also able to get all the Anheuser-Busch products in Busch Stadium in Anheuser-Busch country, which is really neat. The Reds Hall of Fame is a lot nicer than the Cardinals as well. Their fans are also surprisingly nice. The outcome wasnÃ¢â‚¬â„¢t what he hoped for, but it was a good time with great friends. This year is going to be very beneficial for the young talent, and will be great for Reds fans and management to get a better idea of how the young talent is going to fit into the rebuild plans. I would recommend any Reds fan to go to St. Louis for a game. ThereÃ¢â‚¬â„¢s also quite a bit to do there from the arch to the Anheuser-Busch Brewery and everything in between. This one didnÃ¢â‚¬â„¢t belong to the Reds, but the series did. If the rest of the year is like this game Reds fans are going to go crazy folks. Regularly Scheduled Rain Delay: Who Won June? PJ…you going to any Reds/Rox games next week? My pleasure, we had a great time at the game even though they lost. Keep fighting the good fight, and way to represent! Nice picture of Bronson in mid-kick. Thanks, going to another game in Milwaukee this year when the Reds are there. We’re looking forward to it. Yes, had to capture the kick in all its glory one last time. Thanks for the write up. The only game I saw in St. Louis was Cards/Cubs at old Sportsman Park in 1957. These days St. Louis has a lot of problems but it is one of the country’s great river towns like Cincinnati and Pittsburgh.